The Irvine company sold less than 100 homes per month in 2010, but they are opening two new developments in 2011, the Villages of Stonegate and Laguna Altura. I don't talk about what the Irvine Company does much, mostly because they spend so much money putting out the word that my coverage isn't necessary or important. Plus, everything they write is marinated with cool aid, and reading hype gets old quickly. I try to believe them, but i don't. However, since everyone is interested in what the behemoth is up to, I thought I should report on their latest activities. Just over a year ago, the Irvine Co. tested the waters with a tentative homebuilding project in its Woodbury developments, setting a modest goal of selling 700 units in two years. But demand for the homes — featuring revamped designs for homes in the highly rated Irvine school district — went wildly beyond the company’s expectations. This week, the Irvine Co. reported that it has signed 1,234 buyers since the debut of the 2010 New Home Collection 13 months ago. That includes units both in the original seven-project New Home Collection and in an additional five programs in Woodbury and nearby Stonegate East that were added later. “Although the housing market may not have turned nationally, it has unquestionably returned in Irvine,” said Dan Young, president of Irvine Co. Community Development, the Irvine Co.’s homebuilding arm. Studying historical trends, Irvine Co. officials determined that the “inventory” of homes for sale had hit a low, meaning that Irvine was poised for a rebound. But they were careful from the start to say that conclusion didn’t necessarily apply to other parts of the housing market. About 10,000 people turned out for the project’s grand opening in January 2010, with homes selling more than twice as fast as originally expected. Fortunately, they set low expectations. “The incredible sales and rising prices at Woodbury in Irvine were the national new home story of the year,” Irvine-based housing consultant John Burns told the Register. Mark must have signed a big new contract. The Irvine Co. has broken ground on the first of 596 homes it plans to build in a gated housing development on hillsides overlooking Laguna Canyon Road, the company has announced. The sales office and model homes for the new Laguna Altura project — formerly called Laguna Crossing — are scheduled to open on May 14, said Dan Young, the Irvine Co.’s homebuilding chief. Unlike the majority of Irvine Co. homes built last year, this latest initiative will be built entirely by the Irvine Co.’s revived homebuilding brand, Irvine Pacific Homes. Siena: Homes from 1,618 to 1,788 square feet, with prices starting in the low $600,000s. San Remo: Homes from 1,881 to 2,094 square feet, with prices starting in the low $700,000s. Cortona: Homes from 2,380 to 2,962 square feet, with prices starting in the low $900,000s. Toscana: Homes from 2,806 to 3,133 square feet, with prices starting at more than $1 million. Young said that all the homes in the Irvine Pacific Collection have new designs that incorporate innovations used in the 2010 models, such as replacing formal dining rooms with “great rooms,” and providing plenty of storage for items purchased from big-box stores like Costco or Wal-Mart. However, four of the projects — San Mateo and San Marcos in Stonegate, and Siena and San Remo in Laguna Altura — are detached versions of attached homes that the Irvine Co. is building in a separate ongoing development called Stonegate East. “People loved them, but said they would be willing to pay more if they were detached,” Young said. As with the new Stonegate development, buyers will be able to pick out options for their home such as carpeting, cabinets and countertops at a new design center in Woodbury. And lenders will be embedded from Wells Fargo and Bank of America to help buyers apply for loans if they choose. The real estate firm is opening two new developments in the spring. The Irvine Co. is moving forward with plans for two new developments that, when complete, will boast nearly 2,600 properties and could create some 8,000 jobs. Stonegate in north Irvine and Laguna Altura, off Laguna Canyon Road, are being developed by the company's Irvine Pacific affiliate and are touted as the two largest villages to come to O.C. since Portola Springs opened in July 2006. The project capitalizes on the success the Irvine Co. has seen in recent months; the firm's New Home Collection has sold 1,234 homes since it debuted in January of last year – landing it among the most successful developments in the U.S. in 2010, in terms of price and absorption, said Mark Boud, principal of Real Estate Economics. Part of the Irvine Pacific Collection, the Village of Stonegate is located on Irvine Boulevard between Sand Canyon and Jeffrey Road. The project will feature 2,000 homes in four neighborhoods – Santa Clara, San Mateo, San Marcos and Maricopa. Prices will range from the mid-$300,000s to the high-$700,000s. 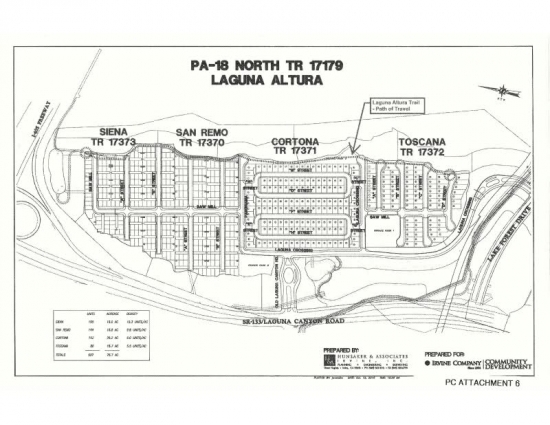 Laguna Altura will feature 596 homes in four communities – Siena, San Remo, Cortona and Toscana. These residences will start in the low-$600,000s up to the low-$1 millions. “The Irvine Pacific Collection provides homebuyers with an array of new-home opportunities, whether they are looking to purchase their first home or take advantage of the opportunity to move up to a larger residence,” said Daniel Young, president of Irvine Co. Community Development. Much like the New Home Collection, Stonegate and Laguna Altura will feature designs aimed at representing a “'way of life' that is uniquely attuned to the hopes, dreams, needs and goals of today's homebuyer in Irvine,” he said. The properties, which include a mix of townhomes and single-family residences, will include designs such as a large central area – known as the Great Room – that blends the family and dining rooms and opens to the kitchen, as well as an indoor-outdoor space dubbed the California Room. In addition, the homes will be designed and built with materials, appliances and energy systems that exceed California building requirements, according to the Irvine Co.
As part of the real estate and homebuilding industry, I am thrilled that the Irvine Company is building homes. However, as I have stated on many occasions, the shills who trumpet the blistering sales rates are talking nonsense. We are emerging of historic lows, and the year-over-year percentage increases sound great, but building 62% less homes in 2011 than we have on average for the last 30 years is hardly a runaway bull rally or a new construction boom. At least the Irvine Company didn't embrace the mid-rise residential tower idea. That product isn't living up to its expectations. Prices in the North Korea Towers are in the bottoming process. Clearing prices are generally in the $300,000s. As you will see with today's featured property, the cost of financing and the price itself has finally dropped enough to put these units at rental parity. Of course, prices would need to drop another 30% to entice a cashflow investor. As it stands, these units are being purchased by cash investors who are speculating these prices will rise in the future. I think the investment is foolish. These units used to have a $1,100 per month HOA, almost nobody in these buildings are paying their mortgages or their HOA dues. The HOA is likely severely underfunded and facing future assessments. I could be wrong, but I would need to see detailed financials on the HOA before considering buying here. These units never made any sense. This is not a walkable area. You won't walk out your front door and frolic about the neighborhood. These towers have nothing to attract an urbanite. Did you see that last property that sold for $285,900? Ouch! Best Value Available at the Marquee! Adorable condo on the 2nd residence level with garden views. Located in Park Place Center with loads of great restaurants, coffee shops, market and easy access to the 405 freeway. This condo doesn't have a view, but is located in the West tower away from the freeway. This condo has finest in modern appointments including wall-to-wall floor to ceiling windows, hardwood floors, granite counters, european cabinetry, travertine tile, built in closets, stainless steel appliances & more. This is a great value and one of the lowest prices in this community. This entry was posted in Library, News on February 21, 2011 by IrvineRenter. Crazy! Mr. Young thinks that it is a great time to buy a house! Who would have thought!? i’ll leave a few classic comments from 2006.
these dumb asses got what they deserve. i’d love for any of these losers to comment on today’s post. It is very simple, for those of you that don’t like Luxury living in a place like Marquee, hey, no one is forcing you to buy here. stay where you are and be happy, what is with all the bitterness. Your bitterness is in result of ENVY. I live at Marquee Park Place and must say, it has been the best move I have ever made. Obviously, the negative comments about this high-end style of living is precipitated from people that simply can’t afford this lifestyle and have no clue about the cornucopia of amenities that are offered here. I think you’re best suited to live in Fresno or somewhere else where prices are falling at a higher rate. You can look up, point and scream all you like, the sky’s not falling. And for us who are writing in here, responding to ugly comments and foaming vitriol, at least we’re typing in the comfort of our secured and well-maintained condo. I guess you can view Marquee as an Ivory tower. People at the top will always have people commenting about them. So just get used to it and enjoy that view Marqueeans! Happy Holidays! It seems from one negative comment all the wal mart people of the world jump on the coat tails of that naysayer and add to the negativity. What I can say is that this building is for a different class of people. Yes there are investors and the like, but I really don’t see people who are your average OC citizen. This brought a wide smile to my face! I remember some of these folks and how obnoxious they were. The $285,900 unit was the smallest unit in the comps above, but was also the most recent comp (Jan. 2011), the others from 2010. New home sales in Irvine in 2010 of half the normal resale volume is impressive. Where else did this happen? And their building more, where else is demand that strong? While others here continue to deny reality, we’ve been saying it all along. Pushing forward with the planned new construction reinforces there’s strong demand and desirability for Irvine. It’s funny when the description is accidentally accurate. Regardless if one thinks the market is inflated or not. This is great news for buyers and should make sellers somewhat nervous. One of the biggest factors besides the artificially low rates that has kept prices from falling further is lack of viable product that can transact. Using zip code 92614 as an example, there are 101 properties in some stage of the foreclosure process. That said, although new construction can be really nice. Typically, they are not the best deals in Irvine. The mello roos tends to be high, they usually have small yards (if any), upgrades are really expensive, and one normally pays a premium that will likely wear off by the time one sells. That said, a lot of these have nice floor plans. I generally recommend resale over new construction. Good deals on new construction typically occur when there is standing inventory and the Irvine Company does an excellent job so this rarely occurs. That said, there will be buyers that are taken out of the resale market as a result of this, leaving more resale deals, selection, and likely better pricing for buyers that have waited. There is no question the Irvine co. understands how low inventory is in Irvine right now and over the past 2 years. They have take full advantage of extremely low inventory in the 400 – 800 range. This is the conclusion i came to last year also when looking at new homes and resales. Due to all the negatives you mention (small lot/no yard, no traditional driveway/front yard setup, mello roos, expensive upgrades) I ended up buying a resale. I really find the new home pricing ridiculous in Irvine….but they still sell them. I guess they were smart enough to put all these homes for sale when rates were low and inventory was tight. I agree with you that the resale market should offer much better deals for those who are willing to be patient when shopping. i pulled the trigger after looking for almost 2.5 years. Congratulations on your new home, I think that you made the right choice buying resale in Irvine. Low inventory, artificially low rates, and tax incentives that pushed demand forward. I’m not sure who you’re referring to here. Whenever I’ve mentioned the surprising sales pace of the 2010 New Home Collection, you don’t respond to me. Do you think selling 1200 new homes in ONE city is nonsense? Irvine has sold as many new homes as all of Orange County combined and that is notable. I still remember when TIC was planning on the 700 new homes for 2010 and all the doubters (myself included) didn’t think they could sell through that in the 2 years time TIC estimated it would take. Instead, they sold 500 more homes in half the time. Don’t hate the player… hate the FCBs. Maybe not for OC… but what about just for Irvine? And they really only have 1250 homes planned for this first phase (although there is a second phase in Stonegate they can ramp up and also a new neighborhood called Cypress Village in waiting). Too many new homes? Maybe… but I thought 700 was too many. The numbers prove there is demand for new housing in Irvine, whether that can be sustained for the next 2 years, we’ll see. Personally… I hope not because I feel TIC’s benchmarks are too high, but that doesn’t seem to stop the FCBs. IHO, well said, the whole point is that building everywhere besides Irvine has faltered. In Irvine the building continues with 50-100% cash buyers. Irvine has in fact been different. IR – i generally support your views but you are pointing to OC data and not specifically to Irvine. TIC marketing is great but not that great to ramp new homes this quickly. There is clearly lots of demand for irvine and its quite remarkable how much they have sold when all other OC cities and even socal have not been able to. We went to new communities in yorba linda last year and their offices were empty. It may be notable that TIC sold 1200+ homes in a year’s time, outperforming their own modest projections but it’s my humble opinion all they really did was capitalize on the tax credits and pull demand forward. If you read their marketing material from that timeframe you’ll notice a subtle but persistent theme, the tried and true “buy now or forever be priced out” seasoned with a touch of “buy into the luxury lifestyle of Irvine!” thrown in. I think they did a masterful job of tweaking buyer’s uneasiness about where the market stood and, to reiterate my point, pulled demand forward. I may be wrong but we’ll see where the sales data lands for these newly released properties. I for one have been keeping a close eye on it as my wife and I are still riding the fence on a home purchase and have had some mild interest in the newly developed Irvine properties along with Portola Springs. We remain on the sidelines as it’s my considered opinion these properties are still overpriced and I still have trouble stomaching mello roos & two hundred dollar HOA’s. That’s all aside the point. You are right, its notable that TIC sold as many homes as they did but it remains to be seen if its a sustainable trend or an aberration. But remember too that Irvine cannot exist in a bubble (pardon the pun), whatever befalls the OC also befalls Irvine. Frankly, I think the cool aid addiction was strongest in Irvine and therefore the longest detox … most of which has yet to fully occur. The bubble is just deflating more slowly in Irvine. Soapboxpolitico, excellent point, 2010 was as close to an ideal scenario for the Irvine company as there can be in a recession. Banks didn’t have to market to market so they were able to hold properties off the market (low supply), rates were lowered to crazy low artificial levels (increased demand and higher purchase price qualification), and tax incentives pulled demand forward and created a mini-bubble in some areas. I don’t think it will line up quit so well this time around. That said, I remember trying to convince a good friend of mine not to buy in Vicara at Quail Hill in circa early 2007, he had a friend that was a mortgage lender that he’d known growing up that had bought a home in there and told him he would get rich and all he needed to to was buy in Vicara. Nothing I could say could change his mind at that point. He went there one day, from what he told me just to look and the builders rep told him that it was his lucky day and that one just fell out. The sales rep told him that “there’s no place else to build in Irvine.” From what he told me later, he pointed across and asked them about the area that Laguna Altura is being built now, he said that they told him that it’s all protected land. He locked it down and there was no turning back. He lost it about a year ago. Laguna Altura is in a great location and with solid floor plans there will be demand. I think that I would be concerned with what’s likely to be a lot of competion if I was considering reselling in Quail Hill in the next couple of years. I’ve been following the development at Altura for some time and I don’t know if it will be worth the premium TIC is demanding. First off, if they are recycling the floorplans for their two detached condos tracts from Stonegate East and Stonegate, those are not worth the $600k-$800k they are pricing them at. And if the floorplans for the two SFRs are anything like Mariposa from Stonegate and San Marino from Woodbury, again… not worth it. Second, it’s more dense than Quail Hill and while gated, not everyone likes that type of community. Lastly, Quail Hill has amenities, access to walking trails, more parks and pools and the elementary school and shopping center. It’s sad what happened to your friend, but those Vicara homes on single loaded streets with view lots and higher elevations should still hold a premium over whatever they will build in Altura… in my opinion. IHO, excellent points, we have had a number of people contact us about Laguna Altura, I communicated the cons to new construction, we will see what these buyers thoughts are. I would think that higher density than Quail Hill would be a problem. No doubt that Vicara is nice. My friend like many others drank the cool aid. Until I found the blog I did not realize that there were other people, outside of my friends in the midwest, that thought 20% gains in real estate and pay option ARM stated income loans were a recipe for disaster. have they embedded the high tension power lines that run around that area into the ground? I vaguely remember seeing power lines running next to the 133 back when we were considering vicara/tapestry. They are still there… on the Quail Hill side next to the Olivos/Tapestry/Sienna tracts. Most of Vicara is interior so they are not as close to the power lines. >and access to some of the highest quality schools in California draw a wide market audience. Well, the highest quality can be a hyperbole very soon. Does it mean the highest quality among all CA schools, including private schools with 10 students per teacher and individual attention? Jerry Brown is considering $1,000 per school student cuts. 40 students per teacher in the highest quality school? Are you kidding? The UC budget won’t receive billions. Not a good sign for foreign home buyers who want to send their kids to the UCI inexpensively. The Irvine school system has been really great and different from what we have seen (comparing with other friends leaving in LA and SD). However, after 7/8 years, it is changing slowly. There are less APAS and GATE programs. But even more interesting, more ‘high-end/rich/whatever you want to call them’ people are moving their children to private school – i dont think it was that common before, because indeed, the Irvine Public school was known as excellent, and classes were not overcrowded like now. That’s the natural progression of a premium scholastic area. The excellent public schools are no longer good enough, and the wealthy and well to do move on to private schools. Irvine is different than most. Most of the move to private schools that I know of were due to sub-par or sub-excellent academic issues. Who wants their kid to be the goat of the class or disqualified from team sports due to low grades? Most private schools will also help with the college application process big time. The recent court ruling that the “fees” for books, classes are illegal. I don’t know if the prior fees will be returned, but continued fees are not allowed. The schools are asking for more donations and cutting the quality of the buses used for team sport’s traveling. BS, the move from the excellent public schools to private schools is due to the “for the children” rat race of Irvine. 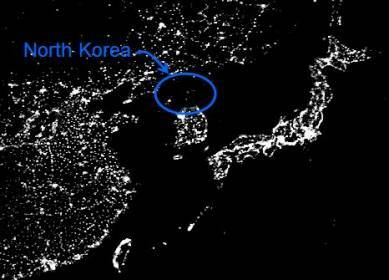 North Korea Towers physical location is not bad for some folks, single or elderly. Within walking distance to some restruants, small organic food store and other shops. The negative are cost per sf, too close to the freeway (noise, fumes and dust), high HOA and the high likelyhood that the paying equality owners will be stuck with the non-payers’ HOA for the last 4 years (a raise in fees by 2x for 6 years?). If you have no kids living with you and lots of money, it might suit you well. To each his own or to each a large bank loan. For overbuilt area’s the real number to look at is vacancy rate. IE area with 30% vacancy is definately overbuilt and will need bulldozers to estiblish a bottom. What’s the current vacacy rate in Irvine (please include empty non-paying houses). I don’t see very many except a few in Quail Hill and Turtle Ridge. I can’t see how the North Korean Towers makes sense for anybody…that includes people buying today at 300K. That nice, fat HOA adds another 150K to that price. All the negatives you mentioned along with having to park your car and drag everything up to your condo doesn’t seem very appealing. This is not NYC and there is plenty of usable land here for people to have attached garages. Just having friends over seems like a royal pain too. No thanks, you can buy a townhouse in other parts of Irvine that make a lot more sense. Like I said to each his own. I know some people who don’t mind lossing $50K to $100K on a house. They just want it now and can afford it (2 income and parents). I think most of IH blog readers are also not on that boat. I’m not in that boat either — just an educated working stiff. Since the HOA covers utilities, I think the non-payers will have little to no incentive to save on the use of water, electricity, heating, cooling, and other free items as squatters. I have observed the lack of shame in America for behavior in the last 30 years. The sense of shame has been limited to not have the latest and best in material goods.